A new study is shedding light on self-taught coders, revealing that 40 percent of leaners are doing so with the goal to either freelance or start their own business. The 2016 New Coder Survey from Free Code Camp asked 48 questions to 15,655 people. According to the data, 21 percent of the coders are women and the median age of respondents is 27 years old. What’s more, most respondents started programming an average of 11 months ago and 28 percent have already landed their first developer job. 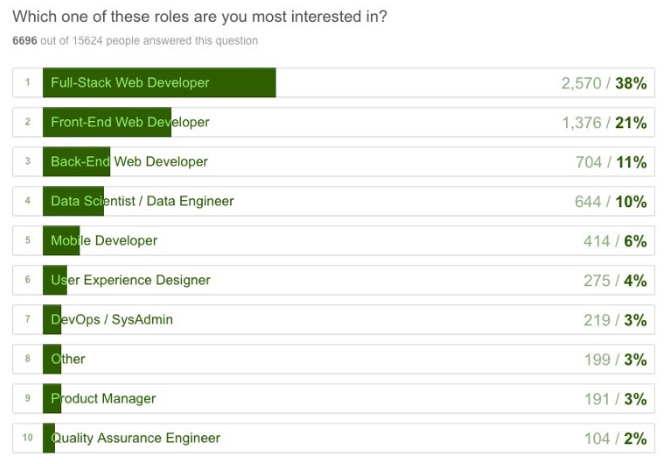 Additional data found that 38 percent of respondents are interested in working as a full-stack Web developer, followed by 21 percent interested in working as a front-end Web developer and 11 percent working as a back-end Web developer. Conversely, 10 percent are interested in becoming a data scientist or engineer, 6 percent want to be a mobile developer and 4 percent want to work as a user experience designer. Other noteworthy findings reveal that 57 percent of respondents would prefer to work in an office with other developers, while just 18 percent would prefer to work from home. Moreover, 74 percent are willing to relocate for a job. When it comes to learning to code, respondents average at least three different sources for their education. Seventy-two percent have leveraged Free Code Camp, while 63 percent have leveraged Codecademy and 32 percent have leveraged Coursera. Further, 19 percent of respondents have attended a coding conference, 16 percent have attended a hackathon and 14 percent have attended a coffee-and-code. Lastly, the survey shows that most respondents (44 percent) are from the United States, followed by India (9 percent) and the U.K. and Canada (4 percent each). Only 24 percent of respondents identified themselves as a minority in their country and 54 percent said they speak English at home with their family. As for education, 41 percent of respondents completed their bachelor’s degree and 17 percent studied computer science. 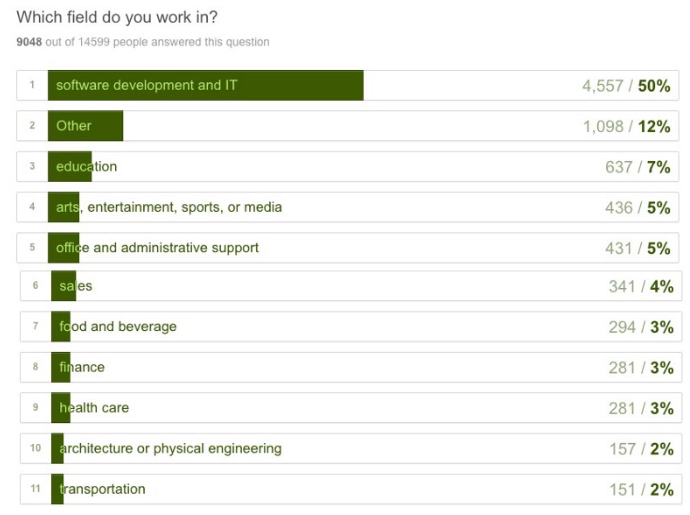 Fifty percent of respondents also noted that they are already working in software development and IT.